Dori Csengeri jewelry is handcrafted in the artist's studio in Israel, "born from my heart, my love of colors and the long tradition of hand embroidery and textile design". Pieces are carefully assembled by hand, mixing silk cords, stones, glass, wood and leather into magnificently bold pieces. All jewelry is backed in ultra soft leather. Most often there are no metals needed in the clasps for necklaces or bracelets, and all earrings are ultra light in weight. The rich texture is difficult to capture in images. 1-5/8 inches long, 1 inch across, lightweight. Made with ribbons in rust and copper orange, olive green, metallic light copper that wind around flat turquoise donut and pumpkin orange glass beads, an art glass dropping below. Backed with soft bronze leather, surgical steel post for pierced ears. Adjusts 17-19 inches long with dual bead buttons and loops, clasp made in the soft bronze leather-backed elements of cords wrapping around faceted glass beads. The same soutache undulates around pumpkin orange beads to the centerpiece design that spans 6 inches of front, up to 1-1/2 inches tall. A simple brass metal wheel charm joins sides, with sculpted soutache and beads on leather, in colors of turquoise, fire red, olive, pumpkin, copper. Light around the neck, but a big statement of design and color. Adjusts 17-19 inches long with dual bead buttons and loops, clasp made in the soft black leather-backed elements of cords wrapping around faceted glass beads. Dual dark saddle brown leather cords curve sturdily to the centerpiece design that spans 3 inches of front, up to 1-1/2 inches tall. Soutache cords in dark brown, burgundy and gold wind around glass and stone beads in colors of burgundy red, turquoise, olive and terracotta. Light around the neck, but a big statement of design and color. And no metal against the skin! 2-1/4 inches long including brass leverback earwire, 1 inch across, lightweight. Made with soutache cords in dark brown, burgundy and gold, that wind around glass beads, glass and crystal drops below. Colors include mustard, burgundy red, terracotta, olive and aqua. Backed with soft black leather. 1-1/8 inches long, 1 inch across, lightweight. Made with soutache cords in dark brown, burgundy and gold, that wind around glass beads. Colors include terracotta, olive green, turquoise blue and burgundy red. Backed with soft black leather, CLIP ON style for all ears. 2-7/8 inches long including brass leverback earwire, 1 inch across, lightweight. Made with soutache cords in dark brown, burgundy and gold, that wind around glass beads, faceted stone drops below. Colors include dull gold, turquoise, terracotta, olive and burgundy red. Backed with soft black leather. 1-1/8 inches long, 7/8 inch across, lightweight. Made with soutache cord in gray and dark metallic pewter, that wind around vintage-look pearl chain and faceted pumpkin color glass. Backed with soft black leather, CLIP ON style for all ears. Adjusts 23-25 inches long with dual bead buttons and loops, clasp made in the soft black leather-backed elements of cords wrapping around faceted black glass beads. Satin silver chain joins the clasp section to the striking pendant that measures 4 x 2 inches. 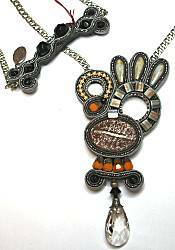 Pendant has sculpted soutache and beads on soft black leather, in colors of silver, pewter, bronze, gold, and pumpkin orange. Clear crystal drop to finish. 2-3/4 inches long including silvertone leverback earwire, 1-1/4 inch across, lightweight. Made with soutache cord in gray and dark metallic pewter, that wind around pearl chain and faceted glass elements, glass and crystal drops below. Colors include gray, vintage pearl and pumpkin. Backed with soft black leather. 2 inches long, 1-1/8 inch across, lightweight. 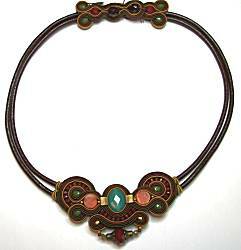 Made with soutache cord in black and dark browns that wind around bronze and black glass and metal beads. The distressed dark pewter flat square is captured on the bottom. Backed with soft black leather, CLIP ON style for all ears. Read about what others think of Dori Csengeri jewelry! Instead of reviews for a specific product, this is a place to share about the designer line in general. Click the title here for a close-up image of a necklace/bracelet clasp and back of an earring. Clasps use no metals! One side is sewn with bead buttons, the other side has materials joined with small openings to fit around the buttons. Allows adjustable lengths, and after extended wear the openings can be stitched to close tighter again if ever needed. All jewelry is backed in soft supple leather against the skin. Earrings are light in weight to be worn in any larger size.